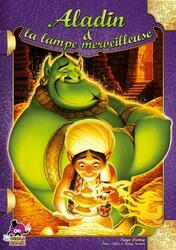 A street child like Aladdin, the wizard sends you to a cave in search of a so-called magic lamp. But the place also contains fabulous treasures! If you are not too greedy and a little reckless, it will be the opportunity for you to become rich! A game turn takes place in 3 phases and everyone plays simultaneously. At first, using your die, choose how many Chest cards you want to draw and in which chest. When many of you have programmed the same number of cards to draw, call on the genie by being the fastest and grant a wish. Finally, and if you have not been too greedy, draw your Chest cards while avoiding scorpions. The game will end when a player draws one of the 3 Chest cards representing the wizard closing the cave. Collect as many gemstones as you can, recreate magnificent finery and accumulate maximum points of victory.